The world of welding is much more diverse than you might think. There are a wide range of different skill sets, techniques and areas of expertise required to be successful in this field. Welders typically work with two materials – stainless steel and carbon steel. Stainless steel is, first and foremost, non-rusting. The reason that stainless steel is resistant to rusting is the chromium that it uses. The formation of a layer of chromium oxide over the stainless steel helps to protect the steel and prevent corrosion. For this exact reason, stainless steel bars, sheets and plates tend to be the preferred material of many industrial applications. Stainless steel can be welded using a range of processes. These include: shielded metal arc welding, gas tungsten arc welding, flux cored arc welding, and gas metal arc welding. Short circuit transfer and spray transfer techniques can both be used. Stainless steels are alloys of iron, nickel and chromium. The filler that you will need to use for stainless steel depends on the application. For more ornamental welds, you can choose cheaper fillers – but for anything with an industrial application, heavier filler will need to be used. Carbon is the main alloying element of carbon steel. Carbon steel varies based on the amount of carbon used. It is classified as either low, medium, high, or ultra high and has increasing levels of carbon content, from 3 percent to 200 percent. The major drawback with carbon steel is that it corrodes and rusts easily, and is used less in industrial applications than stainless steel. However, carbon steel still finds practical applications elsewhere and is usually protected by coatings and linings. Carbon steel is typically the easiest metal to weld. MIG and TIG welding techniques can both be used to weld carbon steel. Where the two materials converge is in the preliminary phase – wearing proper protective equipment, knowing the best joining methods for base metals, securing fixtures, choosing the best process for the application, understanding the appropriate inert shielding gas and choosing the right filler metal needs to be considered for both methods. 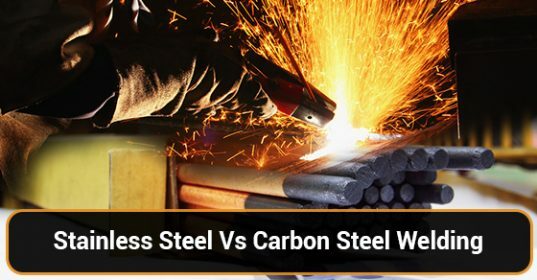 It is important to understand which welding techniques work best on carbon and stainless steel, as well as the difference between these two metals – and what that means for their application. Keep the above information about the implications of carbon and stainless steel in mind to better understand the different welding techniques that can be applied and to know how to approach any welding job throughout your career.